One deck can get you two outdoor living spaces. Take a look at this one in Dublin OH! If you look underneath most decks during a rainstorm, you will see lines and puddles where the water funnels to the spaces between the boards and then falls to the ground. This doesn’t matter if the only ones having dinner down there are insects or the occasional cat, but if you want to create a 2-story outdoor living space, there is a better solution. Luckily, Archadeck has you covered, so to speak. We build what are known rain decks or dry decks. They include gently sloped layers built within the structure to help gravity divert rain and water away from the living area. Let me illustrate with a recent backyard 2-story deck in Dublin. Our client had an existing Columbus paver patio built just outside the back door and surrounded on three sides by the stone facade of the home. The owners thought that they could get even more use from the space by adding a second story deck. This would double their outdoor living space and give them a large area protected from the elements. By swapping out a window for a door on the second floor, we also gave them outdoor access on two floors instead of just one. It’s hard to overstate how valuable an amenity that is. The new raised deck is ideal for enjoying morning coffee or an evening glass of wine. 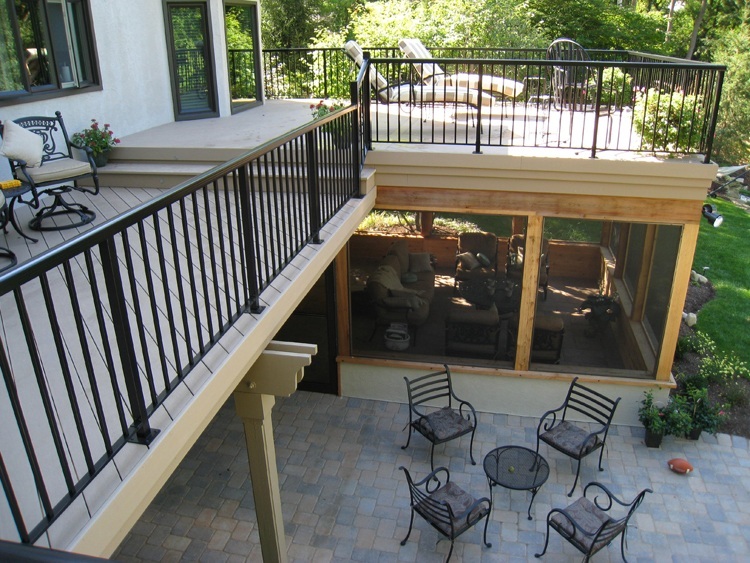 The bronze railing and tempered glass offer a wonderful view of the yard and don’t restrict any light to the 2nd-story windows. On the ground floor, we covered the inner workings of the rain deck with a beadboard ceiling, canister lights and a ceiling fan. Now the space is suitable for outdoor entertaining in all but the harshest of winter weather. Even with this added protection, you are never more than a few steps from a view of the sky and stars. I’d like to point out a few design details. We had to rebuild the seating wall because we needed to put a support column in the space occupied by the old one. We wrapped both the column and the support beam in cedar and painted it to match the home. Similarly, we tied new gutters into the existing system so that it looks like it was always part of the home. 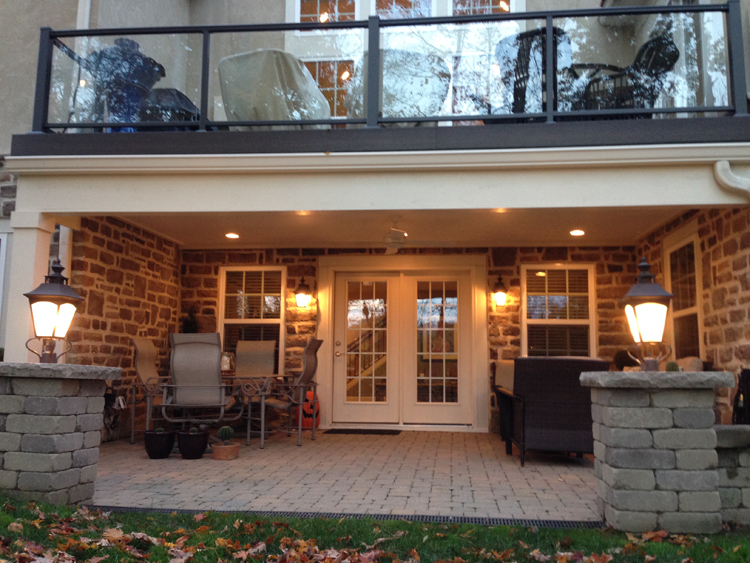 We work hard to integrate all our upgrade projects so that they look original to the home. In this case, we used Timbertech Legacy in Tigerwood and Mocha for the decking; they nicely complement the stone facade. Kudos to our electrician on this job. In addition to wiring the lights and the ceiling fan, he got a little extra work when we pulled out the window on the second floor to exchange it for a door to the kitchenette. When we cut into the wall we were surprised to find that wires had been routed just under the windows in the original construction. Archadeck’s strong relationships with tradesmen of all kinds mean that we are able to respond quickly and professionally to these kinds of situations. If you are thinking of adding a second story deck onto your homes, or if you presently have an existing second story deck we can create an under deck space that will double your outdoor living enjoyment. Our outdoor living combinations make all other “two for one” deals in your life pale by comparison. 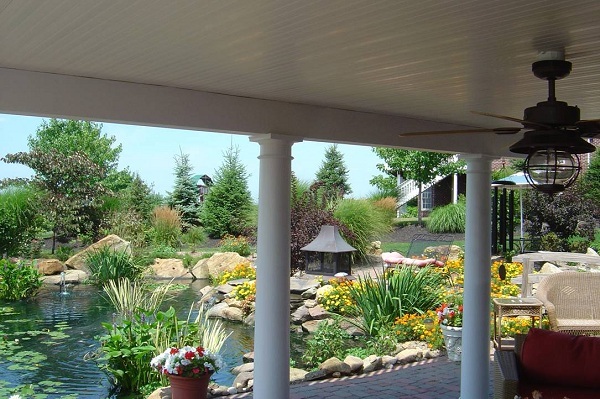 Call Archadeck of Columbus for a free consultation today (740) 879 – 3730 or email westcolumbus@archadeck.net. Author archadeckofcolumbusPosted on November 5, 2014 Categories Decks, Dry decks and rain decksLeave a comment on One deck can get you two outdoor living spaces. Take a look at this one in Dublin OH!